The Imperial commander begins to put his cunning plan into action. 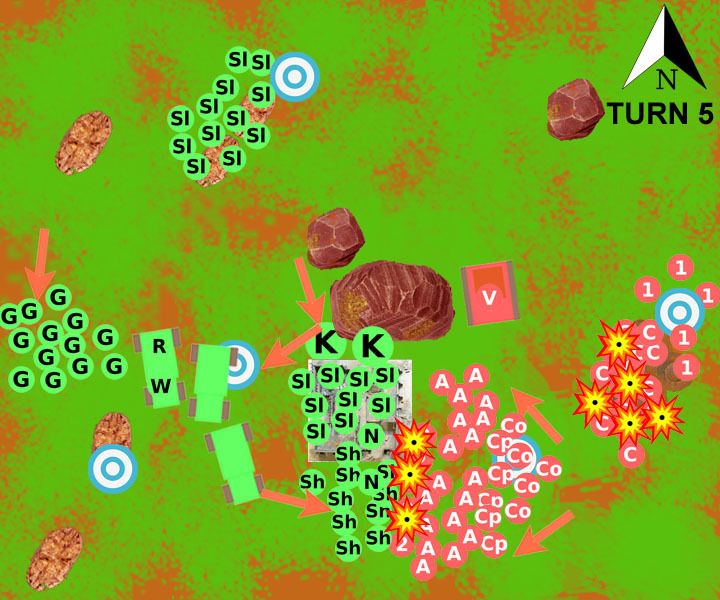 Deploying his squads into multiple lines, he will slow the ork advance by sacrificing each line in turn. Orks armed with Sluggas disembarked from one Trukk to the north of the ruins and unleashed significant fire upon Beta Squad. Meanwhile, orks from a second Trukk disembarked and fired their Shootas, as well. At the end of this fire, only three Guardsmen still survived, but they managed to make their Leadership roll. Elsewhere, the move of the Imperial Chimera had its impact: The orks with Sluggas, who were on foot, changed direction to defend the objective in their deployment zone. Rather than occupy the objective, however, they opted to guard it from a nearby rock formation. At this point, the Imperial commander surveyed the battlefield and realized he had an opportunity: If he lined up his Special Weapons Squad, Alpha Squad, and then his two command squads, he could make a series of firing lines. 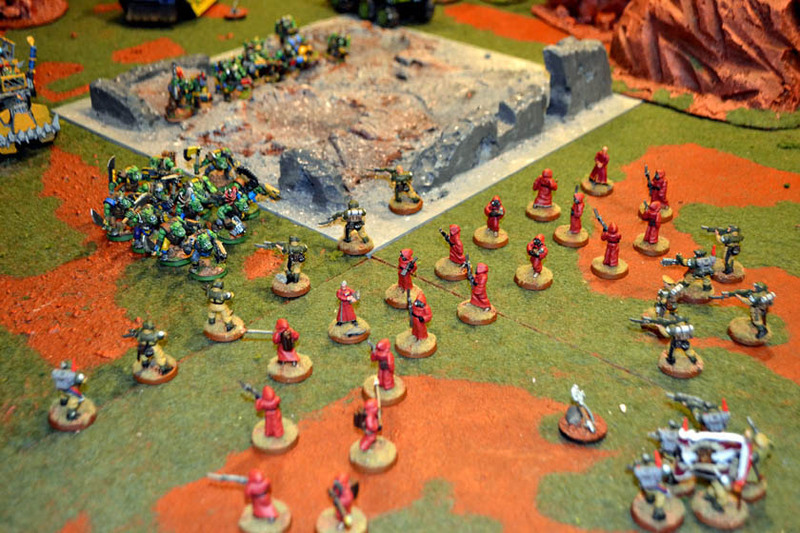 The orks could destroy a line every turn—but still wouldn’t reach the objective they held until the game was over! With that in mind, Imperial forces began to spread out, with the maximum distance between each figure, creating a series of defensive lines. With only a narrow gap in the ruins to reach the Imperial line, the Slugga-equipped squad of orks opted to stand their ground and fire into the Imperial line, but their shots did poorly, killing only one Imperial soldier. In the Imperial turn, Imperial forces continued to spread out and create a massive human buffer between the orks and the Imperial-held objective. 2nd Special Weapons Squad and part of the Alpha Squad fired in their turn, killing seven orks. The orks shrugged off their losses and stood their ground. The Slugga Squad continued its poor shooting, but the Shoota Squad surged forwarded with a roar. They lost two of their number in the charge, but they slammed into the 2nd Special Weapons Squad and killed three Guardsman. The unit made its Leadership roll and held its ground. The Killa Kans attempted to work their way through the ruins, but the gaps in the walls were very narrow, and they were forced to limit their attack to firing ineffectively at the Mechanicus troops. 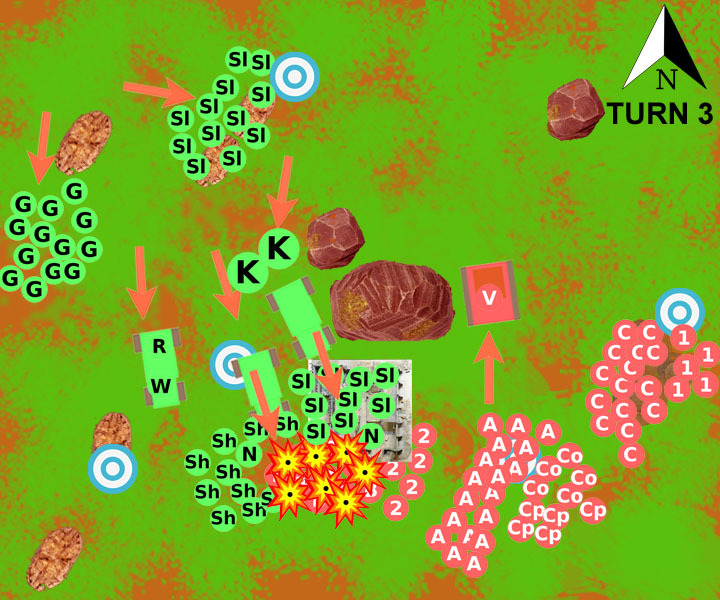 The Gretchins continued their slow progress toward the unclaimed objective in the southwest corner of the battlefield. 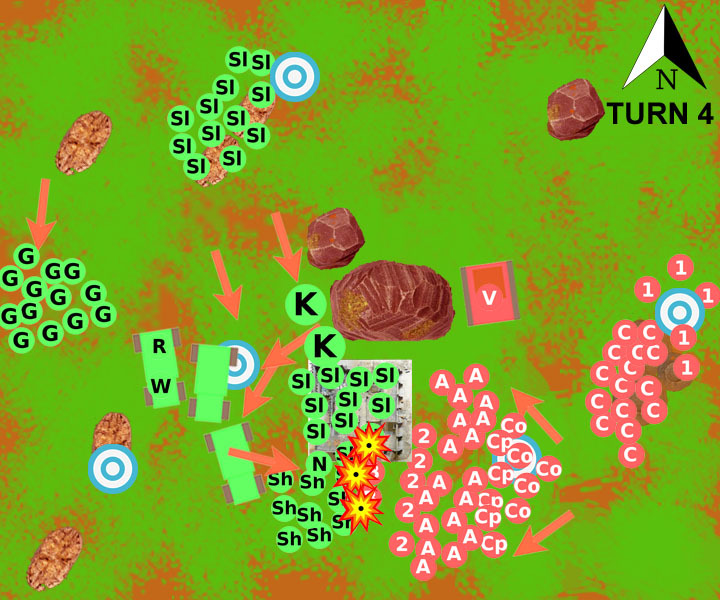 In the Imperial turn, the 2nd Weapons Squad fought bravely, but it was a hopeless cause. Every man in the unit was butchered by the green horde. The more significant Imperial move was to remove Ceti Squad using the “Next Wave” rule, which would allow them to return to the table on Turn Six—perhaps seizing a third objective before the game ended. After so many previous defeats, the Imperial Guard finally had the orks on the ropes. The Imperium simply had to hold on to win. Ceti Squad returned to the table and seized the southwest objective, and the Chimera-transported Veteran Squad roared flat out at the objective in the ork deployment zone. Not only was the objective now contested, the Imperial Guard had gained a victory point for being in the enemy deployment zone (“Linebreaker”). The orks worked hard to turn their fortunes around. Near the ruins, the Shootas and Sluggas plowed into Alpha Squad, but not before the Shootas were wiped out by some amazing shooting by the Mechanicus troops. 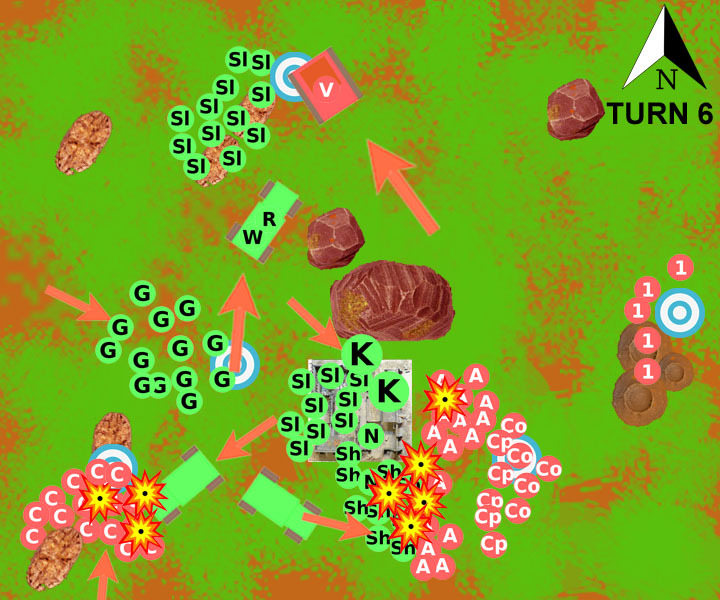 In the melee phase, both sides took seven hits, and both sides made their Leadership rolls. The orks were locked in combat for another turn. Confronted with the Imperial troops seizing the southwest objective, the orks sent a Trukk to “Tank Shock” the conscripts—and, to the annoyance of the Imperial commander, it worked. The conscripts failed their Leadership roll and ran off the table. With that threat ended, the Gretchin turned and seized the objective in the west-central area of the board. Meanwhile, recognizing the danger posed by the Veteran attack on the northern objective, the Warboss turns his Looted Wagon around and heads toward the Imperial Chimera. With the end of Turn Six, it was time to roll to see if the battle was over—or it would continue ….